It’s long been predicted that by the year 2050 every activity performed by humans within the service space, will be done by artificial intelligence. Twenty-fifty seemed so far away when that concept was first introduced in the 1940s, but not so much any more. With firmware being designed to drive software to do our thinking for us, we are in the middle of a vast, seemingly unending, field of possibilities. Oz X Chip is about making sense of the different aspects of progress within the field of artificial intelligence from a layman’s point of view. We investigate how the science of technology is serving us – and itself. 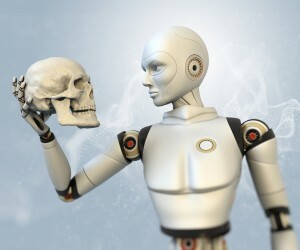 At what point does artificial intelligence become smarter than its creator? In reality we are way past that question. We moved in to the subservient position decades ago. We still control the machines, but science has made them smarter than us so we don’t have to do the mental grunt work. The question that begs; is when will we program a machine to make decisions independently of the humans who programmed it? HAL 9000 of Arthur C. Clarke’s 2001: A Space Odyssey thought it knew best. As the futuristic tale plays out, HAL’s main concern was self preservation. Supposedly designed to put human life ahead of its own, using non-predictive analytics, it made the calculated decision that it was the more valuable asset to preserve. How far afield is that thought now? Science writer and space historian Piers Bizony writes that the film is wrought with future predictions many of which have become part of life as usual today. Some technocrats can imagine artificial intelligence getting an upper hand, but nonetheless stay in denial of a future out of our control. Could we let it go that far? It’s not all scary and apocalyptic by any stretch of the imagination. At Oz X Chip we delve into the exciting applications of AI and the successes that have been achieved with the use of scientific, technological creativity. The great minds of our day, perhaps are playing with fire, but the flame was lit long ago and there is no putting it out. Thank you for joining our readership. We hope you enjoy our articles and welcome your input.